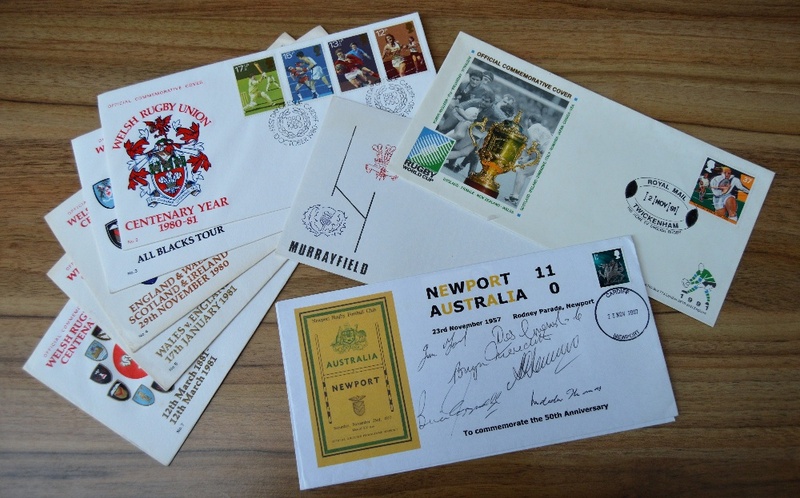 8x Rugby Philatelic First Day Covers inc Signed: 50th Anniversary of Newport beating the 1957 Wallabies, signed by 6 of the home side; RWC 1991 with Twickenham Rugby handstamp; Scotland v Wales Murrayfield 1979 (Arthur Smith Memorial Trust) with special handstamp; and five different WRU Centenary Covers 1980-81, Nos. 2, 3, 4, 5 and 7, with special stamps and handstamps from Cardiff, Cardiff Arms Park and Newport, only two postally used. 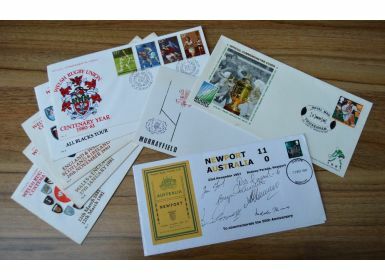 A lovely collection, most with explanatory cards; some quite scarce, esp Newport 2007. VG.